Everyone who owns a website will sooner or later discover something known as SEO. It can be quite daunting to understand what SEO is and how exactly it works. In simple terms, if you have your website optimized really well and getting lots of traffic then its kind of equivalent of having a busy shop on a high street. Oh well, for a beginner this could be a difficult to understand and that's where Lowcostseo comes to help. We will guide you, take you through the processes step by step. There are lots of variable that play a part to get to the top of the search engines. Lowcostseo will provide you some easy to do steps that will help you increase your ranking on the search engines. SEO is constantly changing, with new updates, changes in algorithms and prevention of black hat techniques. One has to be at the top of all of this and continue reading, understanding and learning more about it as you enter the world of SEO. With the amount of algorithm changes Google makes, you have to keep up at all times. However Lowcostseo has top SEO specialists to aid and adjust your site's marketing strategy with accordance to the algorithm changes. Lowcostseo's SEO team has put together 10 SEO tips/guides that one can do to help in increasing your rankings quickly. You must understand that SEO is all about patience and following the guidelines set-out by the major search engines. Its good to play by the rules then against it. 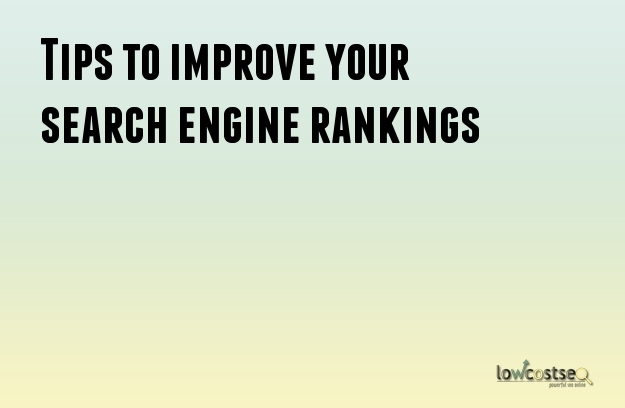 There are lots of factors that determine how the rankings rise e.g the age of your site, the speed factor and also whether or not your site is fully optimized or not. Some webmasters say that in the end that matters the most if the content on your site, the keywords you use and the way in which your site's content is promoted. We always tell this to all SEO beginners " Its easier to play safe and harder to cheat" so do not fall in the trap of black hat SEO as it will lead to your site getting severely penalized where you will loose all rankings for it. Good content will always draw in the audience and that will in turn drive your traffic and revenue too so make sure the right path is always followed. 10. Write for the readers and not for the Search Engines - Make sure when you're writing content for your site, it is for the readers, your target market and not just for the sake of it being optimized for the search engines. Good engaging content is what will bring traffic to your site. 9. Conduct a full site audit to locate any issues - Ensure you figure out any factor that is hindering your site from ranking well. It could be speed issues, broken links or pages or improper Sitemap on the site. Make sure everything is adhered to properly. 8. Try to avoid low quality link sites in favor of high page rankings - In your link building process make sure you avoid these low quality link sites as they will not compliment your site in the long run, so its better to always focus on the best out there from the start. 7. Improve your on-page structure - Here you must highlight the most important content on the site. Adding H1 tags to titles, important words in bold and also hyperlinks too. 6. Creation of title tags that incorporate your keywords - Here you simply add your desired keywords into the title tags for that particular page. This will greatly help your site get visibility on the search engines. 5. Add social sharing buttons on site - We all know the impact social media can have so why not take advantage of this and gain more traffic from the social media marketing side. 4. Add new content on social media site - Social bookmarking sites are very big these days such as Digg and Stumbleupon. Make sure you add your content on there too. 3. Duplicate content - Use copyscape.com to check and remove any duplicate content found on your site. Duplicate content is bad SEO practice so remove it as soon as possible. 2. Make sure your URL's contain the keywords that you are optimizing - Make sure you check the URL structure and ensure that the keywords are added on the url. 1. Regularly add NEW and Unique content on your site - Make sure you are adding new and fresh content to your site as often as possible. The search engines like sites that update their content regularly so make this your number 1 priority. We all understand by now that without search engine optimization it is difficult to attain huge traffic, site visibility on search engines or higher page rank. Today we will guide your through the SEO process with our tips to follow and the best techniques to implement in your campaigns. We hope these will be of help to you. 1. Static webpage – You must have your website’s homepage as a static page for SEO reasons and will aid in indexing too. For any reason you do not use HTML during the site’s designing process then make sure you attempt to place at least a static HTML page or content for crawling. As a tip, always keep the HTML and text ratio higher for quicker indexing. 2. Check website – Firstly check your website properly to locate any broken links and make sure every link is working and that there is no spelling error or domain error on your site. It’s after you have checked for any problems on your site, only then you submit your site to search engines. This way the search engines will be able to crawl the site properly. 3. Robot.txt- This is very important element in SEO and must be followed at all cost. You must use Robot.txt on your site for crawling. Sometimes you may wish to hide some data and do not want it to be indexed hence you can do so via the Robots.txt. 4. Social Bookmarking and Directory Submission – We all know the importance of social marketing in today’s day and age. It is one way to get higher traffic so make sure you have your social buttons on every page. DMOZ is a very popular web directory and nearly all search engines give greater importance to their listing so make sure you submit your site to DMOZ directory to get more visitors. 5. Meta Contents – This is simple the usage of Meta keywords, title, tag and description on each of the webpages on your site. As we have already pointed out the importance of doing so in the previous blogs. Search engines give lots of emphasis on the Meta contents when showing results so make sure to place or write a brilliant meta description, keywords about your website. Here is a fantastic infographic designed by 100webhosting to help us understand what SEO is and what tips we can utilise in our daily marketing campaigns. Every prospective company out there works to get the attention of its target market or online buyers which is why search engine optimization is of great importance. If you have a website and do not invest in SEO then there is no point in having one. More focus means increased amount of leads and sales. This can eventually turn your company into an international brand very quickly. Since there are tens of thousands of sites submitted to them each week the competition within the various search engines is very high. Everyone wants to be on page one in order to get more sales and higher conversions but to do so you need to devise a solid effective Search Engine Optimization strategy. Here are a couple of Search Engine Optimization tips which you could utilize to get more online exposure and raise your position in search results and boost more traffic into your website. - Start your social networking profiles and pages on popular sites; this can get your own company instant attention from social networking users. Social media can not only assist you to get customers but will increase your brand recognition not only locally but also all over the world. Join social platforms such as Google +, Facebook, Twitter, Squidoo and many more. - Assess the titles of your own pages for right keywords and key-phrases; it’s very important if you need to get higher positions in search engine results. Spend your time on researching the best possible keywords for your website and make sure you select a mixture of competitive keywords not only high competition keywords. - Create a sitemap of your site and submit it to popular search engines; this will land on the related pages and can help spiders to make it to your own site easily. Create sitemap in both XML and HTML format and place it on the footer of your site. Make sure the sitemap is also added to the webmasters tools section and look for any errors on there. - To ensure that it offers significant backlinks to your site submit your site to Google Local and yellow pages and other listings; this may also aid your clients to locate your company information readily. Submitting your site to Google Local will enhance your business exposure in your local area, this is specially great if you are a company that operates locally and caters for the local customers only. - Optimize your site with important keywords; Monitor your content for appropriate keyword placement. You can rewrite your articles so that they are optimized for search engines. You can place tags in the graphics or alternative media to bring spiders to the media and content of your own site. - Start an off page optimization campaign; It'll also give you significant back-links and will spread info about your own company across the web. Here you can submit your site details across several web directories and e-zines for the article submissions too. - Sign up for internet marketing courses; this kind of training comprises of short classes that'll educate you on the way to advertise your site, learn the best SEO practices and understand how the various search engines work. Additionally, you will understand the way to accomplish a successful advertising campaign. Most online marketing courses last for just couple of weeks after which you'll have the ability to plan and deploy your own online advertising campaign. - Hire a social networking or Search Engine Optimization specialist for your site –If you do not have the time to dedicate your efforts to SEO then it’s better to hire a SEO Company rather than neglect it. Look for an SEO Company that is on top of the search engines rankings for their own keywords as that is will be a good way to judge if they are good or not. The web has turned into a really busy area with competition getting tougher with every passing day as all big or small businesses want to possess an online presence. These Search Engine Optimization tips can enable you to enhance your internet business and your site ranking across all major search platforms. If you require any assistance or advice, we at Lowcostseo.co are always ready to hear from you!